It's estimated that 70-80% of all moves take place in the Spring and Summer. 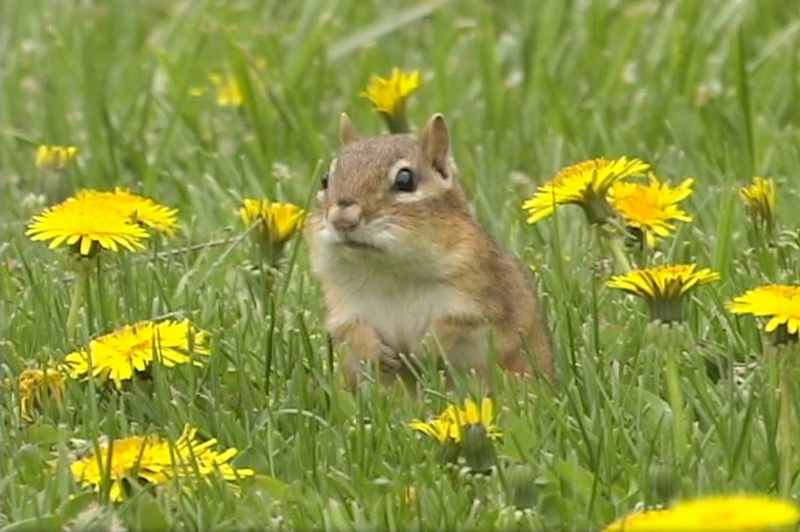 And for good reason wonderful weather being a good part of it. First, weather. Especially in northern states, most people want to move while the weather is better. It’s not just that loading or unloading a truck in the winter is cold, it’s also the chance of unloading all your belongings during a blizzard, or having your truck delayed by an ice storm that shuts down an interstate. For most of the country, summer weather is better for moving. In some cities, June 30 or July 31st are the traditional dates when leases expire. And if you’re a landlord, there are benefits to setting your leases to expire during the summer, especially in older buildings where the landlord pays for heat. Summer moves mean less mud and dirt tracked through common areas, and may make it easier for landlords to complete repairs and repainting. Our education system also plays a big role. School years end in the early summer, and begin in late August or early September. For families, moving during the summer means less upheaval. And it’s not just grade and high school kids: Think of all the college students who move to school in August and return in May, creating demand for rental trucks. Summer is also the time when newly graduated students move to start their first jobs. For many companies, the summer is the slow point of the year, and an ideal time to transfer employees. The fact that it’s easier for their families to move in the summer reinforces this, and makes it more likely that if you’re being relocated for work, it will happen in the summer. The natural cycle of buying homes is partly related to weather, partly related to schools, and partly related to seasons. Home sales pick up in the spring and build through the summer. The weather plays its part, because it’s harder to evaluate a home when the roof and yard are covered in snow. And if you have a family with school age children, you plan to buy a house and move when it will cause the least disruption. But it’s seasonal, too: If you shop for a home in the fall, you will end up moving during the busy holiday season, which most people don’t want to do. At this point, it may also be custom: People expect to move in the spring through the summer, so they don’t think about moving earlier or later in the year. So for all these reasons, the summer is the busy moving season. If you’re moving in the summer, expect that there will be competition for trucks and crews, and that prime dates (at the end of the month) will get booked early. You’ll need to plan ahead, and be patient and flexible as your move date approaches. Use Moving Connections to help you take off to your new destination. Hiring a professional mover to assist with your relocation can result in a smooth and stress-free moving experience. The following are a few reasons to hire professionals to help with your next move. Why hire Moving Connections, a professional moving company! Planning a move can be overwhelming and stressful at times. Professional movers understand the best ways to navigate the roads and how to handle your belongings to keep them safe and protected. Knowing that your possessions are in safe hands will help to ease your mind on moving day. A professional moving company will often be the most reliable option, rather than attempting to move with the help of friends and family. Professional movers undergo rigorous training to learn the best moving techniques so that they can keep your belongings safe. A moving company will be held accountable for your move and will work to ensure that all of your belongings arrive at your doorstep safely. Relocating without the help of experienced movers gives you the responsibility of seeing that all of your belongings arrive safely, which can result in added stress during your move. A moving company will be able to give you a date and time that you can expect all of your possessions to arrive at your new home. Many companies pride themselves on prompt, professional service, and by finding a good mover, you can expedite and simplify the moving process. Not to mention, they can squeeze your couch through that staircase much more quickly than you can! A professional moving company will be more efficient at handling bulky items such as furniture or heavy boxes during your move and will be able to more efficiently transfer all of your belongings to the truck and, later, into your new home. Without proper training, heavy lifting can lead to back strain and other health-related issues. You can avoid all heavy lifting during your move by hiring a professional moving company to assist you with the process. Taking inventory of all of the items in your home can be a daunting task, but a professional moving company can handle that for you. This will help to ensure that all of your belongings arrive safely to your new destination without spending hours tracking each individual box or item in your home. Hiring a moving company often results in a much safer moving process. Experienced professionals understand how to transport items that you may not – load and unload boxes, pack a lamp properly and wrap your mattress safely. To reduce or eliminate damage to your items, they use the right materials throughout the move. Experience counts in moving. An experienced mover will be able to address any concerns that you have and provide a safe, fast and efficient moving experience for you. And be prepared for the unexpected. Be prepared to be blown away by Moving Connections and allow us to be part of this new phase of your life. Moving Connections is a Full Service Moving Company. Moving Connections does both local moves as well as State-wide moving. If you're looking for Movers in the Salt Lake Valley including Murray and Midvale or those further south like West Jordan and Sandy or Draper Moving Connections has some special deals for you. Moving Connections will coordinate these moving services for you from our Salt Lake City, Utah Office. Moving Connections has a reputation as one of the top rated Moving Companies in Utah which we strive every day to reinforce. As Utah Movers we also move beyond the Wasatch Front and move to virtually every city in Utah with special rates to the St George Metropolitan Area including Santa Clara and Ivins etc. Use our online quote form at http://www.movingconnections.com/moving-quote/ to get your free moving estimate from Moving Connections today. Use the following tips this Holiday Season. Moving is stressful, no matter the time of year, but moving during the holidays can be especially hectic for families. It is hard to get in the holiday spirit when all your decorations and the majority of your home is in boxes. 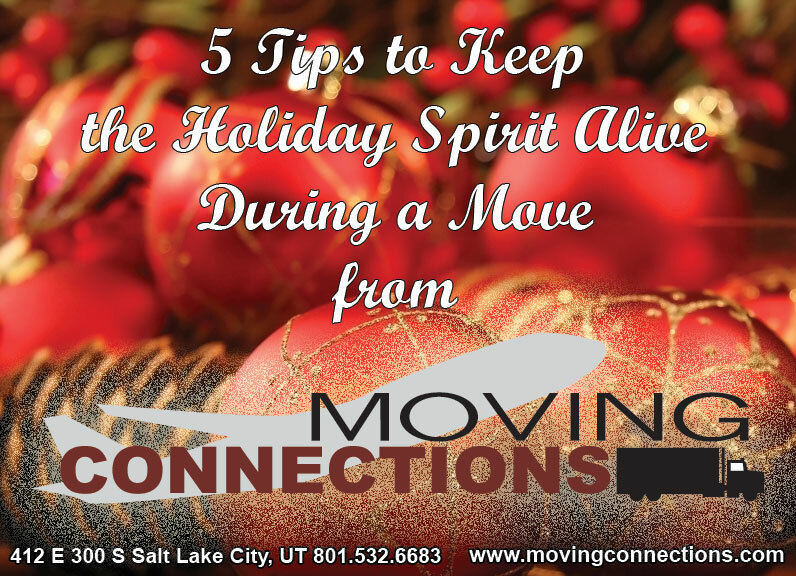 It can also be difficult to keep track of gifts and other holiday items you may need during the move. Keep the holiday spirit alive during a move with these five helpful tips, so you can feel right at home for the holidays. Use decorations to bring the holiday spirit into your home. Carefully pick a handful of decorations to pack that you would like to display in your new home. Label the box and take the decorations with you instead of putting them on the moving truck, if possible. This way the decorations will be in your possession throughout the entire move, and the box will be easily accessible on move-in day. Decorating while unpacking can be overwhelming, but if you have children, decorating is a great task to keep them busy and excited for the holidays. Separate your gifts from your moving boxes ahead of time to make sure that no gifts are packed on the moving truck or misplaced during the move. Either take the gifts with you personally, have them shipped to your new home, or ask a friend or relative to hold them for safekeeping. If you and your family have certain holiday traditions such as St. Nick, Elf on the Shelf, making gingerbread houses, or a white elephant gift exchange, be sure to keep up with your traditions during the move process. It is all right if you have to schedule these traditions before or after your move, but as long as you keep them, the holidays will be all the merrier by celebrating with your family. While unpacking or decorating on move-in day, listen to some holiday music to get you in the holiday spirit! The last thing anyone wants to do after a move is cook, but eating a holiday meal can really put you in the holiday spirit. Before your move, do some research online for restaurants near you that deliver or cater traditional holiday foods like ham, turkey, dressing, green bean casserole, etc. Sit down with your family, share a meal, and enjoy your time together in your new home, where many new memories are sure to be made. Moving during the holiday season does not mean the holidays have to be put on hold! You can easily keep your holiday spirit alive and well by booking with Moving Connections and leave the work to us. We hope you and your family have a wonderful holiday. If you are in need of an estimate for an upcoming move, do not hesitate to contact Moving Connections to begin your move! Join Moving Connections celebrating Independence Day with a $35 instant rebate. Following the defeat of Napoleon in the spring of 1814, the British adopted a more aggressive strategy, intended to compel the United States to negotiate a peace that restored the pre-war status quo. Thousands of seasoned British soldiers were deployed to British North America. In August, the vessels in Bermuda sailed from the Royal Naval Dockyard and St. George's to join those already operating along the American Atlantic coast. After defeating a US Navy gunboat flotilla, a military force totaling 4,370 (composed of British Army, Royal Marines, and Royal Navy detachments for shore service) under Ross was landed in Virginia. After beating off an American force of 1,200 on the 23rd, on the 24th they attacked the prepared defenses of the main American force of roughly 6,400 (US Army soldiers, militiamen, US Marines, and US Navy sailors) in the Battle of Bladensburg. Despite the considerable disadvantage in numbers (standard military logic dictates that a three-to-one advantage is needed in carrying out an attack on prepared defences) and sustaining heavy casualties, the British force routed the American defenders and cleared the path into the capital (President James Madison and the entire government fled the city, and went North, to the town of Brookeville, Maryland). The Burning of Washington took place that night before the force returned to the ships. The British also sent a fleet up the Potomac to cut off Washington's water access and threaten the prosperous ports of Alexandria, just downstream of Washington, and Georgetown, just upstream. The mere appearance of the fleet cowed American defenders into fleeing from Fort Warburton without firing a shot, and undefended Alexandria surrendered. The British spent several days looting hundreds of tons of merchandise from city merchants, then turned their attention north to Baltimore, where they hoped to strike a powerful blow against the demoralized Americans. Baltimore was a busy port and was thought by the British to harbor many of the privateers who were raiding British shipping. The British planned a combined operation, with Ross launching a land attack at North Point, and Vice-Admiral Sir Alexander Cochrane laying siege to Fort McHenry, which was the point defensive installation in Baltimore Harbor. In August 1814, British forces marched on Washington, defeated U.S. forces, and burned the Capitol. Then, on September 13-14, the British attacked Fort McHenry. The failure of the bombardment and sight of the American flag inspired Francis Scott Key to compose "The Star-Spangled Banner." An American lawyer and amateur poet, Francis Scott Key, was on a mercy mission for the release of Dr. William Beanes, a prisoner of the British. Key showed the British letters from wounded British officers praising the care they received from Dr. Beanes. The British agreed to release Beanes, but Key and Beanes were forced to stay with the British until the attack on Baltimore was over. Key watched the proceedings from a truce ship in the Patapsco River. On the morning of the 14th, Key saw the American flag waving above Fort McHenry. Inspired, he began jotting down verses on the back of a letter he was carrying. Key's poem was originally named "Defense on Fort McHenry" was printed on pamphlets by the Baltimore American. Key's poem was later set to the tune of a British song called "To Anacreon in Heaven", the official song of the Anacreontic Society, an 18th-century gentlemen's club of amateur musicians in London. The song eventually became known as "The Star-Spangled Banner". Congress made it the United States national anthem in 1931. Key’s poem was then set to the tune of a popular British song, "To Anacreon in Heaven,” written by John Stafford Smith for the Anacreontic Society, a men's social club in London. Anacreon was an ancient Greek lyric poet, famous for his drinking songs and hymns, and "To Anacreon in Heaven” was intended to celebrate wine, women and song—and the men’s club itself. "The Star-Spangled Banner" (which set Key’s poem to a revised version of the “Anacreon” tune) was recognized first used by the Navy in 1889, and by President Wilson in 1916. It was declared the national anthem of the United States by congressional resolution on March 3, 1931, and subsequently signed by President Hoover. Tied together through the words of the Star Spangled Banner by Francis Scott Key and the unforgettable singing voice of Whitney Houston. Join Moving Connections celebrating our active and retired military members on Memorial Day with a $50 instant rebate. Book your move in May. Tell us if you're active or ritered military. We'll note your booking and on the day of your move we'll substract $50 from your move. Thank you for being ready to defend us. The Civil War ended in the spring of 1865 and claimed more lives than any conflict in U.S. history, calling for the establishment of the country’s first national cemetery. Patriotic Americans in various towns and cities began by the late 1860s to hold springtime tributes to these countless fallen soldiers, decorating these graves with flowers and prayers. Originally Decoration Day honored only those lost in the Civil War, but by World War I it evolved to commemorate American military members who died in all wars. For decades, Memorial Day was observed May 30th, but in 1968 Congress passed the "Uniform Monday Holiday Act." 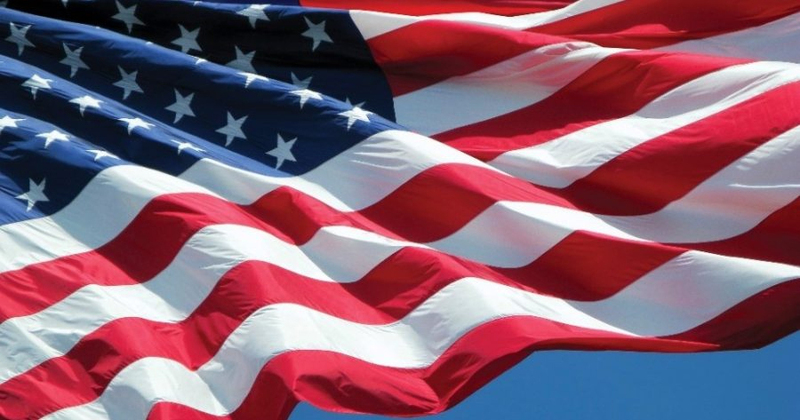 This act established Memorial Day as a federal holiday celebrated the last Monday in May in order to create a three-day weekend for federal employees, which law went into effect in 1971. Join Moving Connections celebrating President Day with a $50 instant rebate.